After you have posted a job, it should appear in the Job Board as shown below. Notice the number under Open Bids is 0. This means no trucks have bid on your job yet. If you click the button, the Selected Trucks screen will open as shown below. Since no trucks have bid on this job yet, there are no trucks for you to select. If you click the tab, you can view notification about jobs you have posted such as when a job was created, if a bid has been filled, a truck bid cancels, etc. The first notification description says "Job was filled." If we return to the Job Board we can see how many Open Bids we now have on this job. This job now has 6 Open Bids which means there are 6 trucks bidding on your job. The button will change to when there are pending bids on your jobs. If you click the Accept button, you can see every truck bidding on your job. There are 6 trucks bidding on this job but you only require 5 trucks, it is now up to you to decide whether you will accept or reject each truck bid. It is important to check each trucks&apos; bid since it might be different than the price you posted. We are willing to pay $4.50 per ton but &apos;MyTruck 8&apos; said he/she will do the job for only $4.00 per ton which will save you money. We will accept his/her bid. Continue accepting or rejecting truck bids until you have the amount of trucks you need to fill your job. 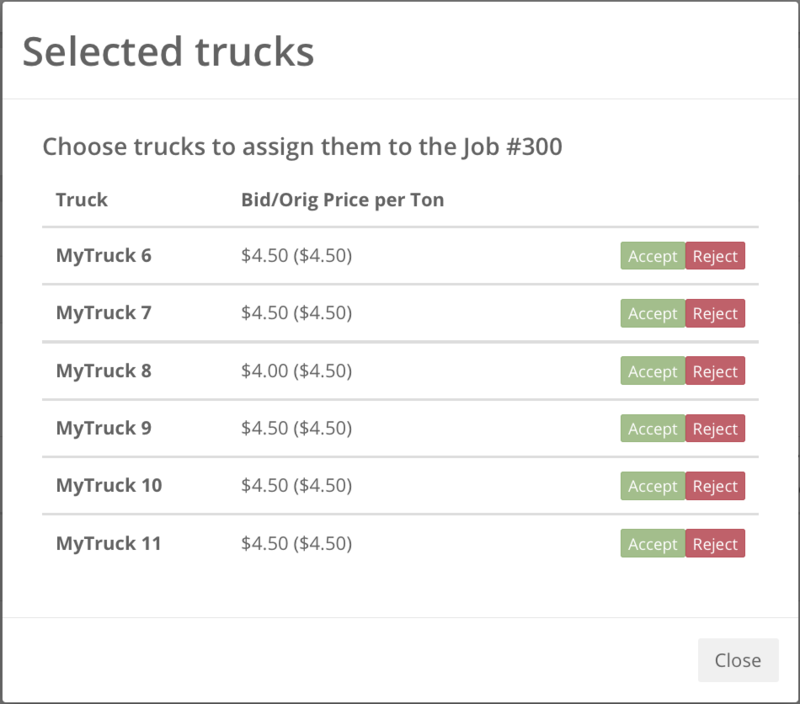 You can also wait to see if additional trucks place bids on your job. Once you have accepted the amount of trucks you need, the job is moved from the Job Board to Accepted Jobs as shown below. From here you can view details of the job. You can also cancel the job. Once you have accepted truck bids for your job, each truck is notified of their acceptance. If you have to cancel a job for any reason, it is your responsibility to login and cancel your accepted job. This will notify each truck and help avoid miscommunication between haulers and contractors.